Jacques Hamel (30 November 1930 – 26 July 2016) was a French Catholic priest. He was born in Darnétal, Seine-Maritime, France. He worked in the parish of Saint-Étienne-du-Rouvray. On 26 July 2016, Hamel was murdered during the 2016 Normandy church attack by two Muslim men pledging allegiance to the Islamic State of Iraq and the Levant while he celebrated Mass in his church. His throat was slit during the attack in Saint-Étienne-du-Rouvray, France. He was 85 years old. Hamel was called a martyr by some international press shortly after his death. Calls to make him a saint started soon after his death. The canonization cause was officially opened at diocesan level in April 2017, after Pope Francis had waived the otherwise mandatory five-year waiting period for the opening of such causes. ↑ Wolf-Mandroux, Pierre (27 July 2016). "L'hommage au P. Hamel réunit politiques et religieux à Notre-Dame de Paris" [The Tribute to P. Hamel Brings Together Political and Religious at Our Lady of Paris]. La Croix (in French). Archived from the original on 14 September 2016. Retrieved 28 July 2016. ↑ "Annonce de la dispense du pape François du délai des 5 ans pour l'ouverture du procès de béatification du père Jacques Hamel" (in French). Église Catholique de Rouen. 3 October 2016. Retrieved 5 October 2016. 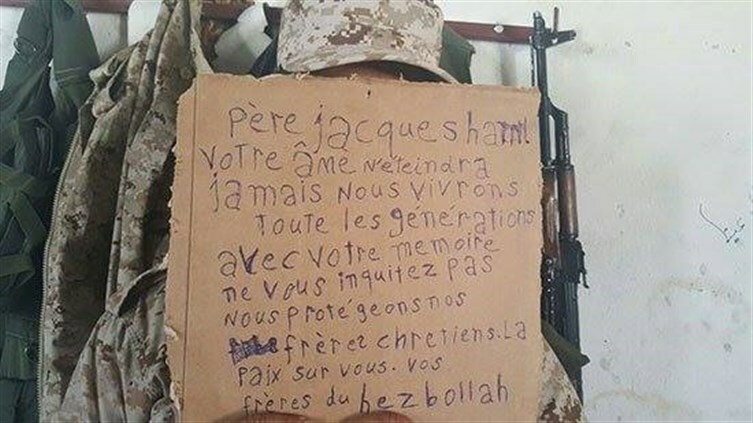 ↑ "Hezbollah salutes Father Jacque Hamel".